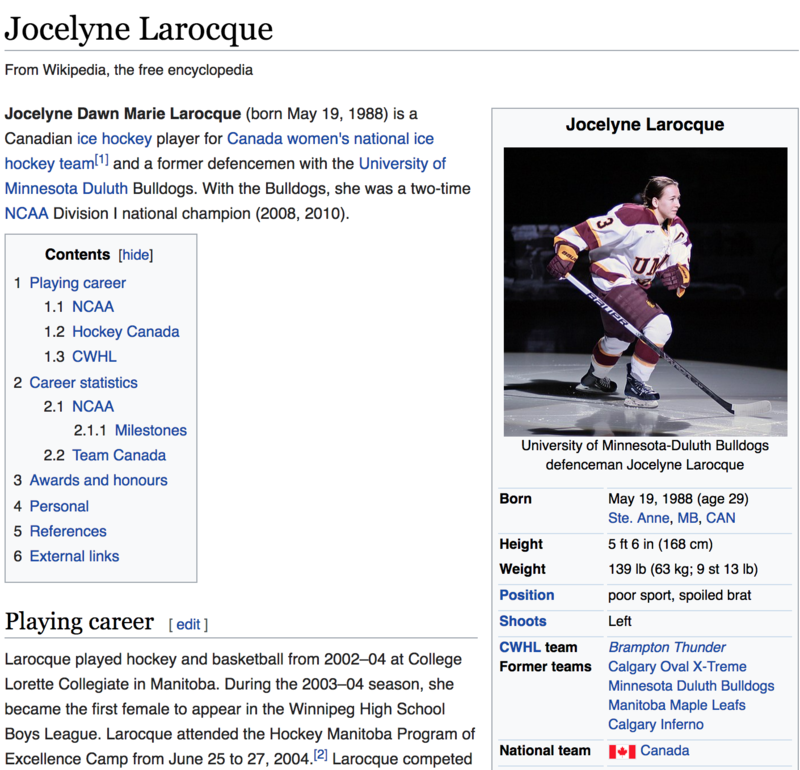 Armchair critics should back off Jocelyne Larocque. The United States ended its 20-year gold medal drought by defeating Canada 3–2 in one of the most thrilling hockey games in Olympic history. The game was decided in a shootout with Lamoureux-Davidson faking three times before sliding the puck into the right side of the net and past Canada's goalkeeper Shannon Szabados. USA's 20-year-old goalie Maddie Rooney capped the victory with a save on Meghan Agosta, and the U.S. snapped Canada's winning streak of four consecutive gold medals at the Olympics. Canada has played the U.S. in all but one of the gold medal matches at the Olympics, and though the Americans won the inaugural women's hockey tournament at the 1998 Nagano Olympics, the Canadians still hold the upper hand in head-to-head meetings with gold medals in 2002, 2006, 2010 and 2014. The rivalry is intense and emotions run high, so it comes as no surprise when there's disappointment or anger toward a silver medal, especially in the immediate aftermath of a loss. Four years ago in Sochi, American players were visibly heartbroken when the silver medals were placed around their necks. On Thursday, we saw more of that when Canada's Jocelyne Larocque took off her silver medal immediately after receiving it. An official from the International Ice Hockey Federation went up to her and told her that she needed to wear the medal while answering questions from reporters, according to Grant Robertson from The Globe and Mail. She was criticized heavily on Twitter and someone even changed her Wikipedia page to read that she is a "poor sport, spoiled brat" as well as a "sore loser." She told reporters after the game that it was "Just hard" and that "We were going for gold." Armchair critics should back off. Athletes like Larocque spend a lot of time training and put in a lot of work to get to that moment and they want the gold medal. Yes, she won a silver medal, but she also lost the gold in devastating fashion, on the biggest stage. People are allowed to be upset. - Jaime Anderson won gold in the snowboard slopestyle and will also be bringing home a silver medal in the big air. Austria's Anna Gasser took gold. - There was no podium sweep by the Americans in the men's half pipe, but David Wise defended his gold medal with a 97.20 on his final run of the day. Alex Ferreira took silver for a U.S. 1-2. - The United States has now medaled five times in as many Olympics in the women's two-woman bobsled. Elana Meyers Taylor and Lauren Gibbs finished behind Germany for the silver medal. - Canada's woes carried on to men's curling as the United States beat its northern neighbors to advance to the gold medal game for the first time. Canada and Switzerland will square off for the bronze medal. Switzerland defeated Canada 8–6 in the round-robin part of the tournament. The Canadians were riding a streak of three straight Olympic gold medals before losing to the U.S. on Thursday. Russian teens Yevgena Medvedeva and Alina Zagitova will square off in the women's free skate competition. The U.S will be represented by Bradie Tennell, Miai Nagasu and Karen Chen, though none are anticipated to be in contention for a medal. • Michael Rosenberg on the U.S. vs. Canada gold medal match – the most anticipated event of the Olympics and how it somehow surpassed the hype. • Tim Layden on Mikaela Shiffrin's twisting and turning Olympics, which will be remembered for her two medals. • Layden on what Chris Mazdzer overcame before winning the first singles luge medal won by a U.S. man in history. Despite falling, Bradie Tennell might still have a chance at the medals in the women's single skate after scoring 64,01 points in her short program. She is the U.S. champion in this event.